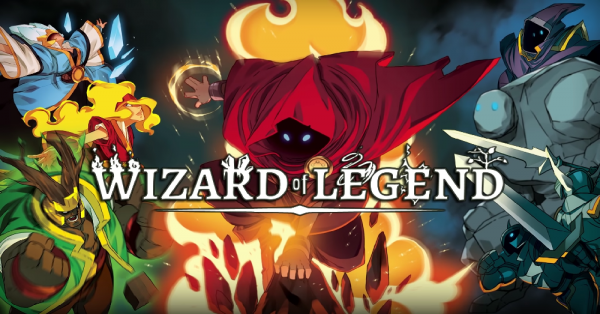 When I first saw images of Wizard of Legend, I will be completely honest and say I rolled my eyes and groaned a bit. 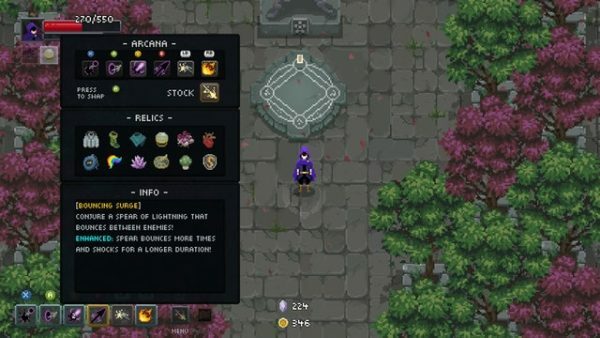 To me it seemed like yet another indie game using pixel art to try and cash in on nostalgic value and save some money by using a less involved art direction. I couldn’t see how the developer and publisher, Contingent99 could sell me on this game at all. I’ve played dungeon crawlers, I’ve played “8 bit” pixel style games and overall I just had a “been there, done that” attitude about it all. After I watched the trailer though, my feelings began to change and I became more excited to play it. I can say, playing it definitely was not the experience I first expected. To say this game is some groundbreaking experience that completely changes the genre would be a bit hyperbolic. This game is very enjoyable, though. This game became so enjoyable for me, I even took my switch with my to my work and played it through my break while playing coffee. This game is a great one to get on the Switch for the portability and the option to put it on a bigger screen if you want to play with a friend. 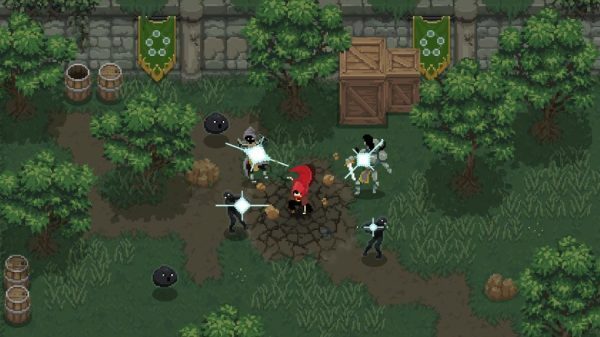 The main idea of the game is simple; are a wizard going through a gauntlet to prove yourself. You will first need to get yourself some equipment and weapons and spells from the main market or you will be pummeled almost immediately. As soon as you feel sufficiently prepared for the dungeons, you transport yourself down and begin your challenge. 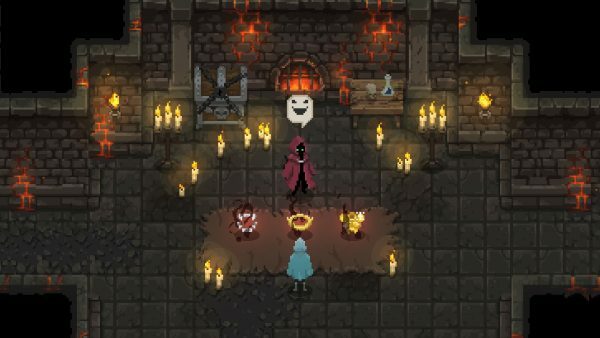 The dungeons are proceduraly generated along with its enemies. What’s interesting about this particular game is the bosses you need to face are also procedurally generated and the environment is as well. If you are going to face the ice boss for instance, the floors you go through in the dungeon will also be ice themed. Every time you die, everything refreshes, but you keep your money earned which means you can make upgrades. Be prepared to die a lot, because you will. These dungeons are difficult, especially if you are flying solo. This game goes much smoother if you are playing with a friend. It took me many deaths and collecting coins to get the right gear to get through dungeons. I will give the game credit though, it doesn’t feel like a slog. Yes, it can be frustrating when you are almost through and then die at the last stretch of a dungeon, but the levels generally go quickly so you it won’t take long to get back to where you were and if you upgraded, it might go even quicker, some of my favorite upgrades was the relic antiquated tabi which gave you a chance to evade and the Arcana Mentis Imperium which charms enemies into fighting each other. This game will give you a lot to collect and try out and play with. The controls on the Switch are smooth and easy to pick up. The pixel art is standard and pleasing enough. The colors are very vibrant, which is what stood out to me the most, but other than that its all pretty standard design. That doesn’t mean its bad, it just means its fine. Overall, this is an enjoyable game for someone craving a dungeon crawler that is good on the go or with a friend. I recommend this for the Switch over Steam personally for the portability alone, unless you only have friends with PCs you want to play with, in that case, choose Steam. Try it out and enjoy some good old fashioned dungeoneering.